How to Transfer Freecharge cash into bank Account. 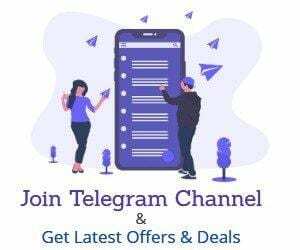 Freecharge Cashback bank Transfer Trick: Hi there I am here again back with a New Trick to Transfer your Freecharge Wallet Cashback Credits to Bank Account.Guys, You Know Freecharge offers many Cashback offers Mostly 100% Cashback offers for Recharges, You can get many Free Recharges using free Recharge But the cashback is Not creditable on Bank Account so Here I found a trick to Convert Your Freecharge balance To Bank Account. 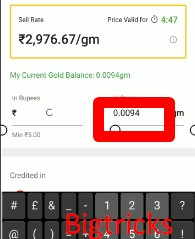 So here we go and start Freecharge Cashback transfer to bank by using Phonepe- Guys you might Know Now you can link your Freecharge Wallet with phonepe and use your freecharge wallet balance for the transaction on Phonepe and Now phonepe is Sellin Gold.You can buy Gold using Your Phonepe Wallet or freecharge Wallet to Buy Gold.later You can Be Sold this Gold and The money obtained from Selling Gold is Bank Transferable. 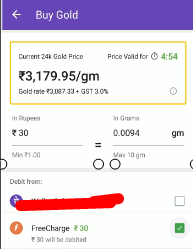 Once You Buy The Gold using freecharge it can be Sold instantly and The Cash will be transferred to your Bank Account instantly so You don’t have to wait like FreeCharge Instamojo trick or others just buy Gold From your Freecharge or Phonepe Cashback amount and Sell.You will get some lesser amount because Gold’ buying Price is higher then selling price. 3.Now goto My account in Phonepe App. 4.here You will see Freecharge Link Wallet Option tap on it. 5.Next, Enter your Mobile Number and Proceed to OTP verification. 6.Once You verify your OTP You can See Your Freecharge Wallet here. 1.Once you have linked your Wallet with phonepe Now you are Ready to Fund Transfer. 3.Enter The Amount equal to The Amount in Your Freecharge Wallet. 4.Proceed to Payment and pay using Freecharge Wallet. 5.Now Just goto Gold Locker and tap on Sell Now. 6.Sell Your Gold by entering available Gold Gram Balance. 7.You will get Your Amount Directly in Your Linked bank account and Additional 5% Cashback from phonepe.